A sound system is a group of DJs contributing and working together as one, making one kind of particular electronic music. This particular usage of the term is derived from the Jamaican sound system culture which firmly rooted itself in the UK in the 70s, which in turn took the name from extensive use of sound reinforcement systems by DJs. Aba Shanti-I, Good Times and Jah Shakas systems are examples. Hip hop grew from ex-pat Jamaican DJ Kool Herc's sound system parties in New York in the 80s. A sound system is a Jamaican patois term for a large street party. In the 1950's in the ghettos of Kingston a new type of public entertainment came about. DJs would load up a truck with a generator, turntables, and huge speakers and set up street parties. In the beginning, the DJs played American R&B music, but as time progressed and more local music was created, the sound migrated to a local flavor. The sound systems were big business, and represented one of the only sure ways to make money in the unstable economy of the area. The promoter (the DJ) would make his profit by charging a minimal admission, and selling food and alcohol. Competition between these sound systems was fierce, and eventually two DJs emerged as the stars of the scene: Clement 'Coxsone' Dodd, and Duke Reid. It was not uncommon for thousands of people to be in attendance. The popularity of a sound system was mainly contingent on one thing: having new music. In order to circumvent the release cycle of the American record labels, the two sound system superstars turned to record production. Initially, they produced only singles for their own sound systems, known as "Exclusives" - a limited run of one copy per song. For this release we return to the roots of Reggae music-The Soundsystem. Throughout the late 1950s and 1960s Soundsystems played throughout the city of Kingston, Jamaica. As well as Sir Coxsone's Downbeat Soundsystem other famous Soundsystem operators included Duke Reid (the Trojan), Prince Buster, Tom the Great and King Edwards. These Soundystems were the birthplace of much of Jamaica's musical culture ­ soundclashes, Dancehall and the idea of the toaster who sang over records- the DJ. As ever Clement "Sir Coxsone" Dodd led the field and so for this release the focus is on DJ's at Studio One and features legendary toasters such as Denis Alcapone, Dillinger and Prince Far I as well as a host of rare material by lesser known artists. Also included is Count Machuki ­ the original DJ- the first man ever to speak over the mic-at Sir Coxsone¹s Downbeat Sound System- from where it all began. As Steve Barrow (author of The Rough Guide to Reggae/Blood and Fire Records) writes in the sleevenotes, Jamaican deejay music is the source for all Rap music: From Count Machuki talking over records on Sir Coxsone's legendary Downbeat Sound System this style would eventually travel to America when the Jamaican-born Kool Herc began playing at Block parties (a version of the Kingston Soundsystem parties) in the Bronx. Cutting up rare-groove classics for the first B-Boys to rap over, Hip-Hop was born and the DJ music that had started on the early Soundsystems of Kingston would go on to conquer the world! Studio One Records is the original Jamaican record label. Studio One Records started the career of hundreds of Jamaican artists from Bob Marley to The Skatalites, from Horace Andy to The Heptones. Studio One DJs (compiled by Mark Ainley) is the next in the series of releases where Soul Jazz Records are showcasing the music of Studio One, the label that literally defines Reggae. 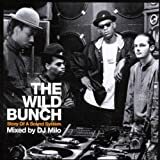 Another major release for ultra-cool UK label, Strut as they present the rise of one of the great UK dance music success stories, The Wild Bunch DJ crew from Bristol, members of which went on to enjoy worldwide success as Massive Attack with their massive selling Blue Lines, Protection and Mezzanine albums. Mixed by DJ Milo. "he can surely turn the tide, he can push the tempest by"